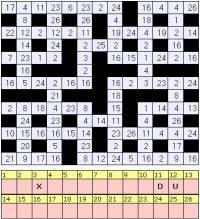 Clarity Media is a creator and a supplier of Codewords puzzles. All Codewords puzzles are created in house and are designed to test logical thinking and command of the English language, and expand and test vocabulary. We can provide various levels of difficulty, with any given number of starting letters to help people solve the puzzle. The vocabularly used can also include specialist scrabble words in addition to 'standard' dictionary words as required. To display Codewords puzzles online, you might like to use our online Codewords player tool which you may license from us. Our Codewords online player greatly enhances the puzzle, doing the find and replace of a number with a letter for you. You can also change your mind and step backwards and each time the grid, codewords letter log and alphabet listing are automatically updated in real time. To see a demonstration of our Codewords player in action integrated on a website, take a look at the Online Codewords Player in action.